Americarpet: Carpet VS Laminate for your bedroom. 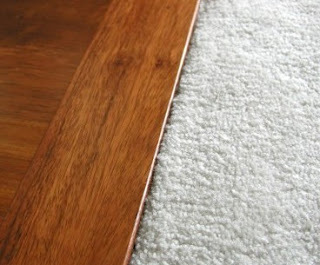 Carpet VS Laminate for your bedroom. Frankly it's going to come down to your personal preference. Some people prefer to feel the cool wood under their feet, and the lustrous accents wood adds to a room. Whereas others prefer to feel the long loop pile fill in the spaces between their toes and the overall plush look a carpet adds to any room. Again, it's up to you to pick. But here are just a few things to consider when selected the flooring for you bedroom. Cleaning isn't fun for anyone, at any age. So let's get it over with as soon as possible. Carpet cleaning can be tedious, but here's how it should be done. Now, according to our friends over at, carter's carpet, if you have pets then it would be best to clean your carpets every six to twelve months. On the other hand, if you're a pet-less household with just yourself and maybe another adult, they recommend waiting on the upwards of two years. On the flip side, laminate is much less maintenance than carpet, but it doesn't give you the "warm and fuzzies" like a carpet would. Let's set the record straight, YES you can mop a laminate floor without worrying about it warping! Now, should water be left sitting on the floor i.e. a small puddle of water be left out on the floor, then yes the floor will warm. Moving on, steam cleaning cannot be done on a laminate floor! It is a bad idea because the steam can and will most likely seep in through the cracks between the planks and compress a lot of moisture down there and ultimately cause the floor to warp. Which of the two is more resistant to heavy furniture; again, it depends. From personal experience, I can say that laminate is very resistant to heavy furniture, whereas, carpet will be left with some indentations. Ultimately it is up to you to decide which you feel would be best for the look and feel you're going for. I'll leave you on this note, when shopping for flooring come into the store with an open mind and keep in mind what it is you're trying to achieve and how you want your room to look. Just coming into a flooring store to look can be very overwhelming. Which is why I highly recommend checking out our website to get a better idea of what you would like to see in your bedroom, or any room for that matter! I read your articles and found the article is very informative! I only recently came upon it, and wish I’d seen it sooner. It does a great job of pulling different topics "cleaning service " — something unique and valuable here. Thanks — hope you keep it up! Why Do Businesses Use Carpet Tile?